When cats cannot adapt to stress it can lead to anxiety, nervousness, hyperactivity, abnormal urine marking, repeated paw licking, excessive scratching, trembling or shivering, and destructive or aggressive behavior. Calming is an advanced formula that contains a combination of ingredients not found in other calming formulas, such as L-Theanine (Suntheanine® brand), and Thiamine (Vitamin B1), all of which support neurotransmitter balance and relaxation to address stress-related behavior. L-Theanine is known to support dopamine and GABA balance, while Thiamine supports normal disposition and a healthy appetite. 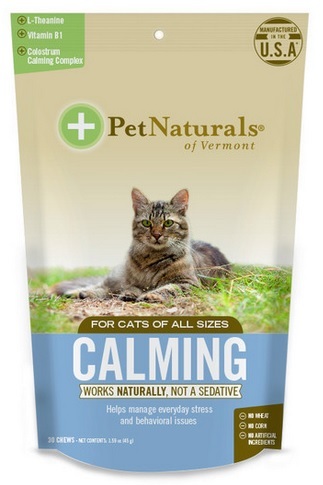 Calming for Cats is available in a delicious chew that cats love, and it is recommended for daily use or as needed. Up to 15 lbs: Give 1 chew daily.